Eugenie de Montijo, Countess of Teba, was born in Spain in 1826. Educated at the convent of the Sacr-Coeur in Paris, she was said to be one of the most beautiful women of her time. Her natural elegance and charisma seduced Louis-Napolon Bonaparte, nephew of Emperor Napoleon I, who had been elected French President in 1848 before ascending the throne as Emperor Napoleon III in 1852. Although his family would have favoured an alliance with a European Royal family, the Emperor chose the Countess of Teba as his wife, saying "I have preferred a woman whom I love and respect to a woman unknown to me, with whom an alliance would have had advantages mixed with sacrifices.". 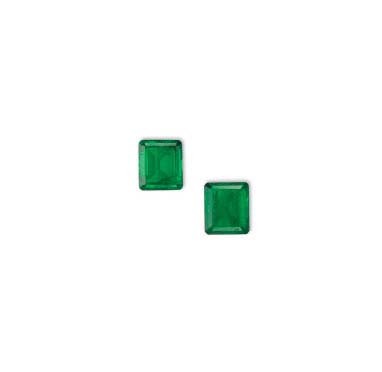 Green being Eugenie's favourite colour, emerald naturally became her favoured gemstone. During their engagement, knowing her passion for jewellery and fashion, the Emperor presented his fiance with an emerald and diamond trefoil clover brooch. Legend has it that this jewel was a symbol of their love as the Emperor had admitted to falling deeply in love with Eugenie while horse riding in the woods, when she stopped to pick a clover leaf she had found particularly beautiful. This brooch became her favourite jewel and she would wear it almost every day, whatever the occasion. Created an Empress by her marriage to Napolon III in 1853, Eugenie greatly influenced French fashion. Her love of jewellery being legendary, she had many Crown jewels remounted to persue her personal taste but also ordered some new pieces from the most famous jewellers in Paris. In 1858, Eugne Fontenay designed a very delicate tiara for her; composed of nine fleurons set with rectangular emeralds, it could also be transformed to be worn with nine drop-shaped pearls. She would be depicted several times wearing it, together with the emerald clover brooch, and it seems that she made the tiara one of her personal treasure. Years later, upon the death of Eugenie in 1920, her will listed 'un étui en forme d'éventail à ma filleule...' (a fan-shaped case for my goddaugther...). Named after her two illustrious godmothers Empress Eugenie and Queen Victoria of England, Princess Victoria Eugenie of Battenberg had become Queen of Spain, less formally known as Queen Ena, after her marriage to King Alfonso XIII in 1906. Touched by the kindness of her cherished godmother, it is not until she took out the fan from its case that she realized the real value of the gift. Below the fan were lying nine emeralds, most probably unmounted from the famous tiara that the Empress had wished to bequeath to a person who she knew would treasure them. To honour the will of the Empress, Queen Victoria Eugenie asked the Spanish jeweller Sanz to mount the nine emeralds in a necklace so that she could be seen wearing it in one of her official portraits in 1922. Following the different trends of the Art Deco period, she had the necklace re-designed several times by Sanz and Cartier, as a sautoir, suspending an emerald cross that was also formerly in Empress Eugenie's casket, and years later, as a shorter necklace, a brooch and a ring. After the exile of the Spanish Royal family in 1931, Queen Victoria Eugenie went to live in England, then in Switzerland. In December 1961, she sold at auction in Bern Empress Eugenie's emerald parure. The brooch and ring were subsequently sold to the mother of the present owner, who had the emeralds remounted by the Swiss jeweller Meister as a pendant and a ring, which are now being offered for sale together with the two unmounted emeralds. Some gemstones have a particular story and have witnessed much more than we can say. Whether it is for their sentimental or historical aspects, they differentiate themselves from the others in carrying an integral part of our history. And it is quite rare to be able to mention that the future owners of these historical emeralds will have the immense privilege to hold in their hands two gems that once reflected the soul of an Empress.